Our carpet cleaning services can remove existing stains and help prevent future ones. 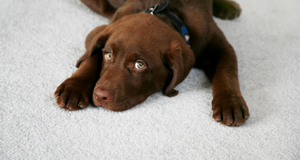 Drink spills, food stains, and pet urine, can break through the protective finishes on brand new carpets, causing stains that are difficult to remove. Color-added spots such as Kool-Aid, mustard or red wine can actually dye your carpet fibers and are very difficult to remove. The longer a stain is left in the more difficult it will be to remove. Do you have soil filtration problems? Soil Filtration is a term used to describe dark, grayish ring around the edges of your carpet. This has become a common problem today because homes are much more airtight than in the past and because aromatherapy and burning of candles is so popular today. This is not a carpet defect, but a situation in which dust and other airborne pollutants such as soot from burning candles or from poorly ventilated fireplaces can accumulate on the carpet face fibers in areas with a concentrated flow of air over the carpet or through tiny cracks or other open areas under the carpet. The soiling condition can occur quickly, or it may develop over a period of months or years. Filtration soiling is not a result of the quality of carpet selected. The condition will obviously appear more pronounced on lighter colored carpet. Our trained specialist have the expertise needed to remove these unsightly black lines. Faulty plumbing, broken appliances, wet weather. There are a lot of ways flooding water can get into your home. When you have water unexpectedly enter your home you need to professional help. Don’t allow the water to dwell for days as this can cause mold and other problems. At the first sign of flooding, stop the water source if possible and then call us. We can respond quickly and help restore your home to the place it was before the mishap. We hope it never happens to you. But if it ever does, call RightWay and we will get your carpet dry in the quickest possible time.